Experience the Change of Seasons With "The Rattler"
The leaves are starting to change up in the mountains of North Carolina and Tennessee; it's time to get going on a ride you'll want to take over and over. This ride takes you on a 30+ mile jaunt through the mountains and valleys just north of Maggie Valley and Waynesville up to the tiny town of Hot Springs, nestled near the Tennessee border. Start: Exit 104 on Highway US 74. Lowes store at this exit. Pass under US 74.Follow NC 209 north. 3.7 mi Cross I-40 at Exit 24. It’s an easy ride through the valleys for a few miles. 11.9 mi Turn Right onto Betsy’s Creek Road to continue on NC 209. Ferguson’s store / gas marks this corner. Lots of signs. 22 mi Junction NC 63. Note and pass through. – Store and gas at this junction. Popular spot for a break, loop returns here. 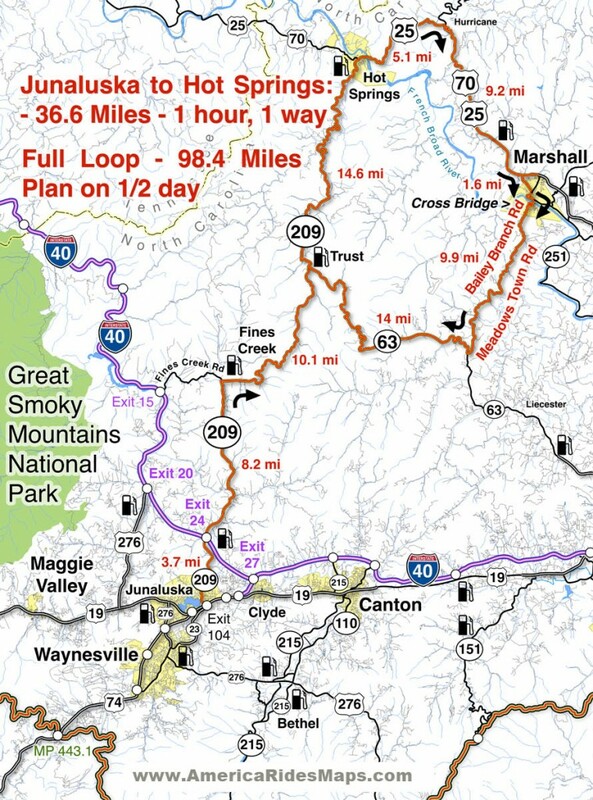 36.6 mi NC 209 ends at Hot Springs. Return as you came or continue on loop ride. 41.7 mi Turn right @ stop sign to continue on US 25 / 70 towards Asheville. 50.9 mi Veer right into Marshall on Main Street. Follow into town. 61.6 mi Turn right at the traffic light in the center of Marshall and cross the bridge over the French Broad River. You are now on Bailey Branch Rd. It will become Meadows Town Road.Meadows Town Road ends in 10 miles at NC 63. 71.5 mi Turn Right @ stop sign and follow NC 63 to return to the mid point of NC 209. 85.5 mi Turn left @ stop sign onto NC 209 and follow back to Junaluska to finish the ride.